According to CNN, "dozens of people have been killed and 2 million forced to flee their homes across eight prefectures after record rains pounded southwest Japan, triggering widespread flooding and deadly landslides." Japanese news NHK reports "85 people are dead, 6 are in critical condition and at least 58 are missing." "The Japan Meteorological Agency upgraded its alert system to the highest level in large areas of western Japan, while lifting the warning in other regions." "About 364 millimeters (14.3 inches) of rain fell between 5 a.m. and 7 a.m. in the city of Uwajima -- approximately 1.5 times the average monthly rainfall for July." 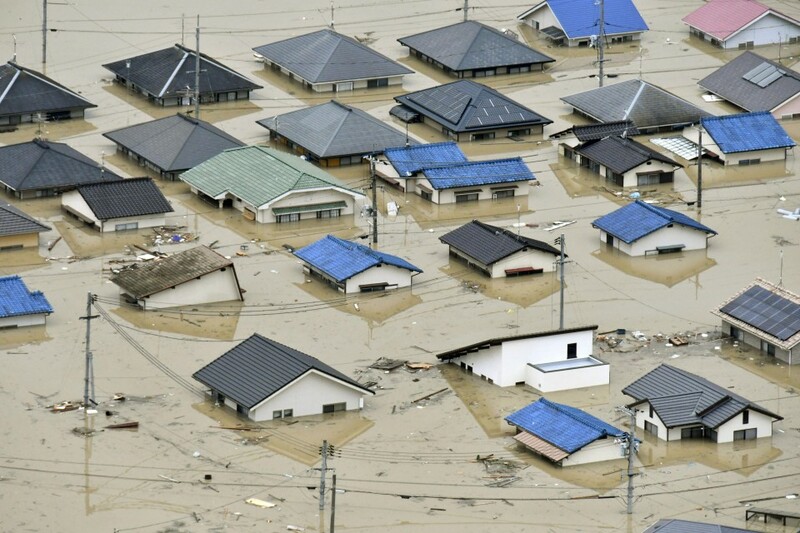 "In Sukumo City in Kochi prefecture, 263 millimeters (10.3 inches) of rain fell in two hours." "Japanese Prime Minister Shinzo Abe said 54,000 personnel had been mobilized for search-and-rescue efforts"
"We've never experienced this kind of rain before," a weather official said. An official at the Japanese Meteorological Agency told a news conference: "This is a situation of extreme danger." "Record rainfall caused rivers to burst their banks in Hiroshima and other areas." "Two million people have been ordered to evacuate. PM Shinzo Abe said rescuers were "working against time". "There are still many people missing and others in need of help," the prime minister told reporters on Sunday." "Since Thursday parts of western Japan have received three times the usual rainfall for the whole of July, setting off floods and landslides." "Most of the deaths have occurred in Hiroshima prefecture." "Within a 72-hour period, 93 locations reported record rainfall, John Matthews reported for NPR in Tokyo." "Millions of people were advised to evacuate their homes. Some houses have since collapsed, while roads and bridges have closed. Officials in Kyoto prefecture say they are trying to control flooding at several dams." "The government plans to mobilize pumper trucks to drain the water but it may take two weeks to fully drain, Kyodo News agency reported." "Responding to the tragedy, U.S. Ambassador to Japan Bill Hagerty tweeted, "Deeply saddened to hear of the lives lost due to heavy rains and flooding in Western Japan. Praying for the safe return of those still missing." "
Asian Access will post further developments once they are known. Within a few days, we anticipate being able to provide a firsthand account from inside the disaster zone.